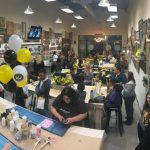 If you are looking for a warm, welcoming and open atmosphere where you can relax while embracing your inner DIY master, you have found it at Board & Brush’s wine, paint and wood sign workshops. No matter which location you visit, you are guaranteed a warm greeting by our friendly staff and a fun and energizing workshop! Once you arrive, you will be guided to your seat where all of your supplies will be waiting for you. All you need to bring is yourself and a can-do attitude. While creating your personalized DIY project, you will gain the experience of distressing the wood, sanding, assembling your boards, and choosing the stain and paint options exactly to your personal preference to match the décor of your home or to give as a gift. Our wonderful instructors and assistants are on hand to lead you through every step. At the end, you will have a custom wood sign that you will be proud to hang in your home for years to come. Our Workshops offer low VOC stain options and water based paint, so the impact on the environment and you is minimal. Low VOC is similar to water based stain, but the advantage is in it’s luxurious, warm, vintage coverage on the wood. This is what gives our home decor pieces that truly weathered look. Don’t be fooled by other workshops that say water based is better for your design or the environment…it is NOT! We welcome wood sign craftspeople of all skills! 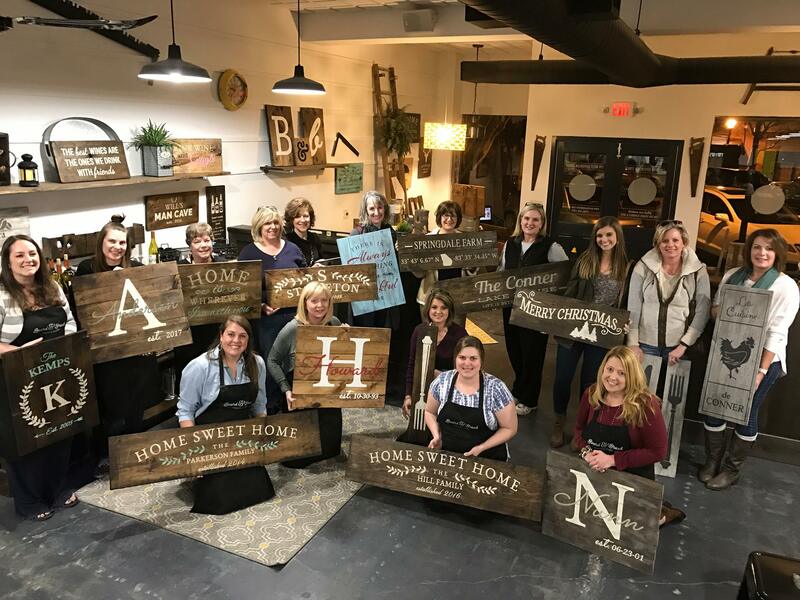 Whether you are already a master craftsman or a DIY diva or a complete novice, you can rest assured knowing that our instructor-led workshops will provide you with the information you need to create your own personalized wood sign masterpiece. 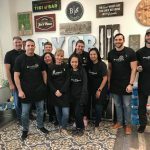 If you have a particularly large number of individuals interested in signing up for a wood sign workshop or a special event coming up, consider scheduling a private event. To find a location nearest to you, visit our Find My Studio page. There you can input a ZIP code or allow our site to auto-detect the best studio based on your location. View your studio location’s calendar to find a date and time that works best for you and your friends or family (the more, the merrier!). Browse our online gallery! Choose your favorite design from one of many, including quotes, kitchen, laundry, sports, children, family and other designs. Once you know your design, fill out the sign-up form and click on the “Complete Registration” button. 4. Show Up & Have Fun! That’s really it! You bring you—we’ll take care of the rest. Sessions typically last three hours, but these can vary a bit depending on studio. Be sure to arrive a little early to find your seat and get settled in—we start our DIY workshops on time! 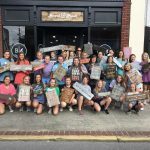 Sign Up for a Wood Sign Workshop Near You Today! 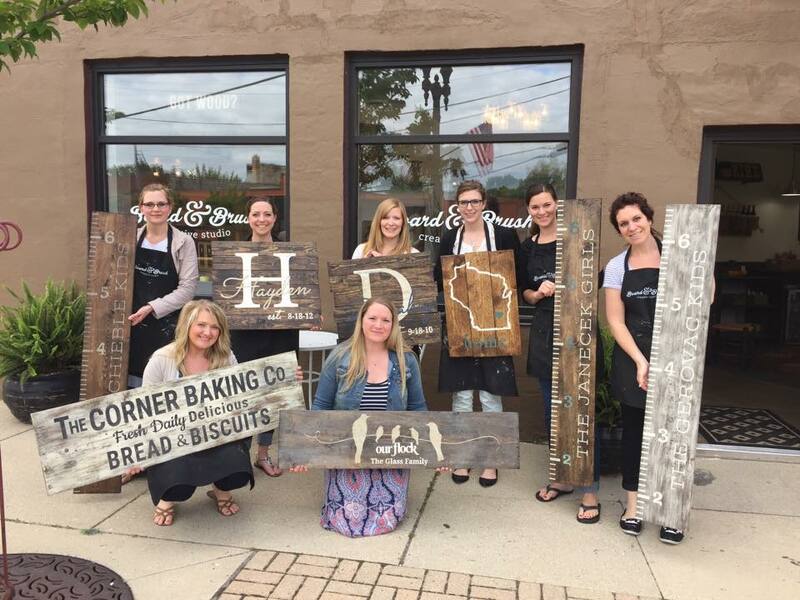 Join the next Board & Brush wood sign workshop near you. Find your local studio and sign up for the class that works best for your schedule. We look forward to seeing you in studio soon!